The concept of bourgeois revolution remains a contentious one in the Marxist tradition. In 2012, Neil Davidson published his highly-acclaimed and aptly titled study of the subject, How Revolutionary Were the Bourgeois Revolutions? Davidson questioned the validity of the concept outside the sequence of so-called classical bourgeois revolutions that occurred at the beginning of the modern era. At the heart of the controversy is how far a process that, in its essence, concerns the supplanting of one form of exploitation by another can be deemed to be in any way progressive. There is the related issue of how such upheavals can be considered ‘bourgeois’ when the said class existed, at best, in only an embryonic form. Of these, few would dispute that the French Revolution at the end of the eighteenth century was pre-eminent in terms of its global impact. The seismic upheavals experienced in France during the decade that followed the fall of the Bastille in 1789 played a major role in the formation of Marxism itself, with both Marx and Engels entering political activism in the 1840s as representatives of a generation that had to come to terms with the ambiguous legacy of the revolution. In the last century, Marxist historians of the first-order such as Lefebvre, Soboul and Rudé continued to explore at length the lessons that practitioners of proletarian revolution might learn from their bourgeois counterparts. 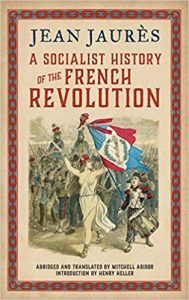 This first English translation of A Socialist History of the French Revolution is a welcome reminder that these better-known historians of the twentieth-century were anticipated decades earlier by Jean Jaurès. He was a prominent leader of the French Socialist Party who, unfairly, is probably best-known today for the manner of his death rather than for any practical and theoretical contributions in his lifetime. Jaurès was assassinated at the beginning of World War One for adhering to his anti-war convictions – in notable contrast to most of the European left which crumbled in the face of the tide of jingoism. This publication is a condensed version of the original four volumes published at the beginning of the last century. Inevitably, the passage of time means that many of Jaurès’ interpretations look anachronistic and have been surpassed by subsequent research, but his account is powerfully written and acts as a refreshing antidote to the wave of right wing studies that now pervade the subject. The Canadian Marxist historian, Henry Heller, provides a valuable introduction that frames the current debate on the meaning of 1789: ‘French Revolutionary revisionism must therefore be viewed in the context of the post-structuralist movement which became hegemonic in the humanities … this reaction in turn can only be understood as part of the capitalist counter-offensive which gained momentum from the 1970s’ (ix). Jaurès is overdue recognition in the Anglophone world for his promotion of a Marxist perspective on 1789 and for his exemplary determination to avoid a reductionist account that attributes the causes and courses of the revolution to a single dynamic. Jaurès judiciously advises his readers: ‘don’t forget that Marx – too often simplified by narrow interpreters – never forgot that it is upon men that economic forces act. There is an enormous variety of passions and ideas among men and the nearly infinite complexity of human life doesn’t allow itself to be brutally and mechanically reduced to an economic formula’ (6). This non-mechanistic agenda is one of the strengths of Jaurès’ account and underpins his impressive ability to achieve a finely-tuned calibration between the interplay of the tectonic forces of history and the actions of flesh-and-blood individuals trying to adapt to rapid and disorientating shifts of power. Many of the great personalities of the revolution are sketched in a vivid style that captures the contradictory forces operating on them as they sought to survive amid the dialectical collision of process and moment. Danton is describes as possessing ‘the noble rage of a man who had tried everything to avoid a terrible crisis; who had run up against the blind selfishness of the factions and who ran up against it again when he tried to moderate events that he couldn’t prevent’( 181). Danton’s great partner and rival in the eye of the revolutionary storm is similarly portrayed as being torn between irreconcilable political pressures: ‘The opposing forces of demagogy and “moderantisme”, between which Robespierre balanced his polices, had fallen; he now had to find his equilibrium within himself; in his own ideas, in his own policies’ (222). Readers brought up on the pallid narratives of the revisionists may recoil at Jaurès’ hyperbolic style but he is surely justified in deploying it to convey the impact of such an unprecedented event on the personalities of those at the storm-centre. The origins of the rupture that brought Danton and Robespierre briefly to control the affairs of late eighteenth century Europe’s most powerful state, is unambiguously attributed by Jaurès to the rise of the French bourgeoisie . The revisionists, such as Cobban and Furet, have questioned the traditional Marxist account of 1789 on the grounds that this class was not suitably cohesive at the time and lacked the political unity to topple the absolute monarchy of the Bourbons. Jaurès correctly points out that there had, in fact, been a significant gestation of economic development within the womb of the absolutist state throughout the second half of the century: ‘Under the Regency, Louis XV and Louis XVI, internal commerce had expanded greatly. It’s impossible for us to evaluate the figures but its rapid growth is certain. The conditions and wealth of boutiques in all small and mid-sized cities struck the admiration of all visitors’ (18). Further evidence of the validity of Jaurès’ view is the crucial role played after 1789 by the Girondin faction, which predominantly represented the views of the traders and mercantile bourgeoisie of France’s Atlantic seaports who profited from the Atlantic slave trade and were eager to compete with the maritime superiority of the British state. Jaurès ‘ account of the roots of the revolutionary crisis also explores the vital role of Enlightenment philosophers such as Montesquieu, Voltaire and Rousseau in paving the way for the ideological hegemony of the bourgeoisie before it made its bid for power. The superstructural edifice of the absolutist state was hollowed out from within by the intellectual incursions of the above and their colleagues in the decades preceding the fall of the Bastille. As Jaurès concisely puts it: ‘On the one hand the French nation had reached intellectual maturity and on the other the French bourgeoisie had reached social maturity. French thought had become conscious of its grandeur and desired to apply its methods of analysis and deductions to all of reality, to society as well as nature’ (13). The only aspect of the build-up to revolution that is not sufficiently incorporated into Jaurès’ account is the role of external pressures on the Bourbon state, forcing it into the fiscal crisis of 1789. Military and financial assistance given to the American Revolution in the preceding decade had left the French state with crippling debts that could only be resolved by summoning the Estates-General in May of that year in a vain attempt to reform the tax system. The predicament the Bourbon elite found itself in can only be understood with an appreciation, derived from historical materialism, of how Britain and Holland – the era’s two most advanced states – exerted economic pressure on the French to compete with them economically and militarily. The revisionists overlook this crucial international dimension of the revolution in their desire to frame the event as primarily a dispute within the higher echelons of the French ruling class. It is indubitably the case that the rising bourgeoisie lacked homogeneity during the crisis of 1789, but that was inevitable considering that it had evolved within the confines of the absolutist state and therefore many of its members had significant ties to the feudal aristocracy. As the first phase of the revolution gave way to the intensified radicalisation of 1792 which abolished the monarchy, the fault lines within the emergent bourgeoisie became more apparent. Jaurès rightly recounts how the blood-curdling threats of foreign invasion by the reactionary monarchies of Austria and Prussia, commanded by the Duke of Brunswick, necessitated the usurpation of the centrist bourgeoisie, personified by Lafayette. As Jaurès vividly puts it: ‘For the first time the revolution felt the breath of the Prussian horses in their faces’ (111). The legendary mass mobilisations from below that characterise the French Revolution – including the fall of the Bastille, the women’s march on Versailles and the assault on the Tuileries – are what gives it pre-eminent position in the annals of bourgeois revolutions. The distinctive aspect of all these popular upsurges is that they represented the decisive intervention of the urban sans-culottes in the course of events. This class of wage-earners in the major cities, made up of shopkeepers, artisans and small traders, was the most militant section of the Third Estate and provided the ballast for the set-piece mobilisations that drove the revolution forward. Although they can be seen as an embryonic working-class, they were, at this point in time, incapable of independent political action. Jaurès is alert to the historical limitations affecting this nascent working class: ‘that the proletariat was briefly able to boldly climb the ladder of events to the leadership of the bourgeois revolution – or at least participate alongside the most daring bourgeois – was for it a security and a promise for the future’ ( 36). What Jaurès is insightfully alluding to here is the temporary alliance of 1792-4 between the most radical sections of the bourgeoisie – including the Jacobin leadership under Robespierre – with the most class-conscious elements of the urban poor to form a political bloc capable of combatting counter-revolution from within and without the country. Like Goethe more famously, Jaurès perceives the historic significance of the battle of Valmy in 1792, when a French army made up largely of armed sans-culottes stunningly defeated a professional force from Prussia: ‘The bells of the old steeples until then had rung for festivals of resignation or mystical hope … now they rang in the hearts of men, in the hearts of the peasants in the hearts of the woodsmen, the great hope of liberty, the great hope of right’ (125). As the revolution faced the prospect of being quashed in blood, only these two classes operating in tandem could provide the required level of political centralisation and social mobilisation to resist the armies of reaction. Jaurès imperfectly, but accurately, captures how the Committee of Public Safety in this period encapsulated the contradictory nature of the regime that successfully fought off Austrian and Prussian invasions and also implemented price controls to alleviate hunger in the cities: ‘in a time of crisis it is necessary that a strong government, bearing within itself all the energy and power of the revolution, rise above the two classes, mastering the selfishness of one and enlightening the ignorance of the other’(205). This climactic phase of the revolution, of course, also witnessed the widespread use of executions known as the Terror, which remains, for most people, the dominant image of the era. Jaurès does not underestimate the loss of innocent life that undoubtedly took place but neither does he have time for the hypocrisy of those who denounce the use of the guillotine and ignore the centuries of oppression and injustice that preceded it. He quotes from the debate in the Convention on the execution of the King: ‘That woman who cries today over the fate of Louis Capet also went to the crossroads to see the execution of a father who, revolted by the despicableness of a hoarder, attempted to lighten the weight of the cost of his basic needs’ (quoted on 146). Furet claimed that the Terror represented the ‘derapage’, or the ‘skidding off’ course from the liberal achievements of 1789 into a blood-soaked cul-de -sac. Jaurès, more justifiably, argues the Jacobin regime was the only realistic means to secure such gains in the face of intractable opposition at home and abroad. Jaurès perceptively points out that once the Austrian army had been conclusively defeated at Fleurus in 1794, the less ideologically committed members of the bourgeoisie felt secure enough to move against Robespierre and dispatch him to the guillotine (242). Jaurès’ history of the revolution is probably not the best place to start for those looking for a Marxist introduction to the period. There is no mention, for example, of the remarkable militancy of women revolutionaries such as Claire Lacombe and Pauline Leon in sustaining the radical momentum. However, his version is far preferable to the modern revisionists who regard all revolutions as regrettable accidents that should be avoided. Jaurès, in contrast understood that the reason to study past revolutions was to help shape future ones: ‘They allow us a foretaste of the great, ardent and free life of communist humanity which, freed from servitude, will take control of the universe through science, action and dreams’ (7).